My heart breaks for you. No other way to say it. The world upside down right now. A sick and sad situation. Thank you very much for embedding this song in your post, Daniel. I had listened this song in Vietnamese, Chinese and English in past. Tonight in Spanish. I could not remember the name of this song (English version), Anyone know?. Thanks. We have Vietnamese version for many famous songs around the World. and another one bites the dust, yeah! Chicken are coming home to roost. anonymour [pleas use a screen name] and another one bites the dust, yeah! And in La Habana, no less. Not to worry. It will be easy to find another clown who will proclaim, "There is no corruption in our government." Dano: your post reminded me of another one written by someone here using the words of the tango Cambalache as a guide. Here´s the link: http://www.voces.com.uy/articulos-1/cortandogruesocambalachefrentistaporalfredogarcia Maybe it will serve as consolation; we're all in the same boat! Here is the Vietnamese version of the Historia de un Amor. Sung by singer Ngoc Lan in early 1980 (in US) who has passed away in 199?. The Vietnamese lyrics is in white color on the video. This Vietnamese/French versions is also sung by many other singers in Vietname in early 1960-1970 years and even now. i do not know how the words are in vietnamese but the words in french have no resemblance to the meaning in spanish. I have to say I was totally surprised that that song would be translated and sung in Vietnamese! What a trip! Daniel: The important thing now is to safeguard what you can and duck the wave that is coming. I don't know if the opposition is simply too scared to act, to stupid to make hay while the sun shines or whether there is some secret pact signed on the banks of the river Styx that keeps them from scoring points. This latest Chavez show is going to continue for a couple more weeks at least. Whatever it is he has is probably more serious than what has been reported, and may indeed end his "career" earlier than anyone thought. My feeling is that there is an internal battle at the top going on over who will replace him, and how. The knives are flying fast and furious between the different factions, with the military on the side trying to decide who to support. Where, for example is Diosdado? What is Aristobulo doing? Jaua comes out telling the oppo not to mess with him, and then clams up and continues as if nothing is happening. There's a great smell of rotting fish, and no breeze to blow it away. Quite unfortunately, Latin America in general has a basic respect for Castro.Secondly there are many idiot North Americans who do as well, not to mention loads of idiot Europeans.At the very least there is a benevolent tolerance. What Castro could not obtain by force in the past, he can now obtain without even minimal physical violence( to the highest gratitude of " pacifists"),simply because Chavez permits it to happen.Amazing how passive- aggression often goes un-criticized , yet the Cuban invasion is bountiful in future combatants. How many now have cedulas? Here in my small US town the police routinely catch Mexicans who hide in trailer camps cranking out false social security cards that give illegals false identities...Is anyone going to deny that this is happening to the nth degree in Caracas with Cubans, Arabs , Chinese , and other nationalities? People in Venezuela tend towards a naivety that is mind boggling to me.I would never be so 'caida de la mata' as to ever refer to Chavez as a viable democratic candidate.To even discuss it is wrong, because he is not.Elections are a farce in Chavezlandia. There is a new book out about Mexico's social problems. http://www.latimes.com/features/la-ca-jorge-castaneda-20110619,0,2317904.story I have not read it but most of the issues sound so much like Venezuela's and other LatAm countries even what you were talking about at Puerta Del Sol a few weeks ago. Powerful stuff Daniel, and very sad. 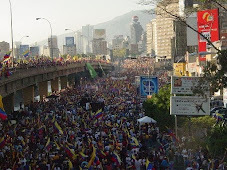 Let us hope that God steps in and gi ves Venezuela a chance to get a new leader!